What causes economic growth? You would think the answer to this basic question would be fairly well agreed upon by economists. After all, economics has been a field involving rigorous inquiry for well over a century and has certainly attracted its share of the “best and the brightest”. British economist John Maynard Keynes, as reflected by the “lord” title, was already a legend in economics when Churchill made these remarks. And to this day Keynes continues to greatly influence economists, with his theories often being used (and abused) as justification to expand the role of government intervention in economies around the globe. ”“Economics as currently presented in textbooks and taught in the classroom does not have much to do with business management, and still less with entrepreneurship (innovation). The degree to which economics is isolated from the ordinary business of life is extraordinary and unfortunate. Government is increasingly seen as the ultimate solution to tough economic problems, from innovation to employment. Economics thus becomes a convenient instrument the state uses to manage the economy, rather than a tool the public turns to for enlightenment about how the economy operates. When Coase and Wang hosted a conference on China in 2008, they noticed that many Chinese academics had never talked to either policymakers or entrepreneurs from their own country. They had learned only what Coase calls “blackboard economics,” sets of theories and mathematical relationships between bits of data. ”“I came from China. We have a lot of nationals come here (to the U.S.); they’re taught game theory and econometrics. Then they’re going home … without a basic understanding of how the real world functions. Coase and Wang are not alone on this issue. Perhaps you have heard of Nate Silver, the statistician and journalist whose reputation for accurate election predictions has vaulted him towards rock-star status. Silver’s modeling correctly forecasted the results for 49 states in the 2008 presidential election, and he bettered that in the recent presidential election and hit on nearly all the Senate races as well. Silver is engaged in the very “searches for mathematical relationships between data” that Coase criticizes. Silver believes the purpose of statistical and mathematical analysis is “modeling for insights”. Insights gleaned can then be melded with good old human judgment that encompasses common sense, intuition, and non-quantitative analysis to make reasonable predictions. What Are the Signals Amidst the Noise? As we have argued on previous occasions, we agree that economics suffers from “too much math”. Armed with elegant mathematics and statistics, many economists overemphasize in their analyses those factors that can readily be measured. Less quantifiable factors are often relegated to noise status. But in many cases—like the question of what drives economic growth—hard to measure factors are of profound importance. 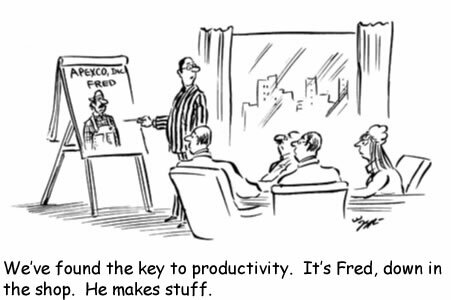 As the earlier cartoon about Fred suggests, innovation and its impact on productivity growth are key drivers of economic growth. And the mega-forces behind innovation are the ideas of the growing multitude of Freds around the world engaged in the daily pursuit to find better ways of doing things. The current trends prevailing in innovation and human ingenuity strike us as both resilient and robust. Technological development and its falling costs continue to permeate everyday life. On factory floors characterized by our cartoon Fred, in office cubicles, and tinkerers’ garages around everywhere, DDM (direct digital manufacturing), 3-D printing, and simulation software are so profoundly enabling innovation that some are calling the trend the beginning of another leg to the industrial revolution. Adding fuel to the productivity trend is the fact that low cost communication technology has made idea and knowledge sharing a global process of unprecedented proportion. The cross fertilization of ideas, among the minds of more Freds than ever before, is taking place in amazing fashion. Of course, only time will tell if the scope of what is unfolding will qualify as another industrial revolution. But there is no denying that the unrelenting push for productivity growth at the individual business level has created numerous opportunities in companies providing the tools of productivity growth. Fiscal cliff? Divided government? Trouble in Greece? The beat goes on for productivity growth. While acknowledging technology trends, some economic stagnation proponents point out that recent innovations are small potatoes in comparison to the big developments like the auto, the airplane, electricity, or indoor plumbing. Is this a meaningful signal that economic progress is stagnating? In our humble opinion this “test” fails to reflect the bigger picture of what is unfolding. “On what principle is it, that when we see nothing but improvement behind us, we are to expect nothing but deterio”ration before us? First regarding air travel itself. Flying has undergone a massive “democratization” in that its cost has become within the reach of a growing proportion of the world’s population. Granted we may not be moving people faster. But we are moving a significantly larger proportion of the population, and we are moving them much more safely to boot (the fewest domestic fatal air crashes on record were recorded in 2012). The same holds true regarding the cost and ability to move goods around the globe for both small as well as large companies. This democratization of transportation has given birth to entire industries related to catering to travelers and to the development and management of efficient global supply chains. These industries in turn are now employing scores of Freds as a result. Furthermore, what is emerging is much bigger than the air industry. In an economy that is powered forward by ideas that can now “go viral” and fly around the globe with the push of a button, and where most of the accumulated knowledge of the world is but a download away, it sure does not seem that the speed at which we can move a person in physical terms is the relevant measuring stick of innovation and economic progress. Perhaps another real world example is worth considering. 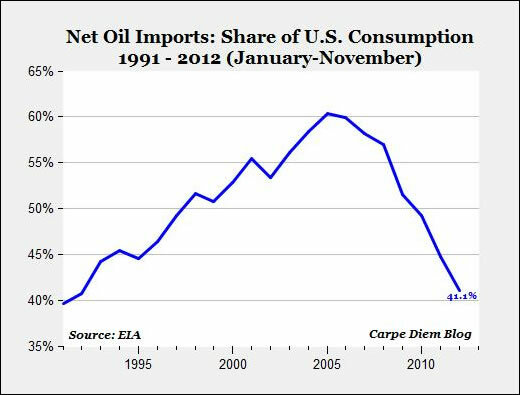 Over several decades, administrations of both parties have offered up policies aimed at making the U.S. “energy independent”. Despite likely good intentions and the billions of dollars spent on these policies, the goal has remained elusive. Now, however, thanks to the ingenuity of some Freds within the energy sector, a potential game-changer with respect to domestic energy production has emerged. The ideas of horizontal drilling and hydraulic fracking, along with the speedy adoption of these techniques, have set the stage for the changed energy situation as demonstrated by the chart to the right (click it for a larger view). What causes economic growth? The collective great mind of many millions, and soon to be billions, of people constantly tinkering away in a never ending pursuit of finding better ways of doing all the intricate and interwoven things that underlie and comprise the economy. This hard to measure—but very real—dynamism behind the economy suggests a future considerably brighter than the economic stagnation predictions offered by so many prognosticators. From an investment perspective, we think that several implications emerge from all of this. As noted earlier, the innovation trends offer significant investment opportunities. Companies involved with providing productivity and innovation tools should continue to find strong demand from customers striving to compete in hyper-competitive global markets. The dynamic trends have clearly intensified creative/destruction action within the business environment. Familiar corporate titans like Kodak, Blockbuster, JC Penny, or Sears are mere shadows of their former selves in terms of sales, earnings, relevancy, and perhaps even viability. But for investors, the fall of the displaced signals potential opportunity in the emergence of the displacers. In addition to the providers of productivity tools and services noted earlier, emerging payment systems, the trends towards mass customization in consumer goods, and increased thriftiness on the part of consumers are opening new growth markets for companies like eBay, Fiserv, Starbucks, and TJX. The third implication is that the scale of the global marketplace has grown such that companies’ business fortunes may no longer be tethered either to the country in which they may be incorporated, or the country (and currency) where their shares may be traded. For years, the stocks of Japanese car manufacturers rewarded investors even as their home market Nikkei Stock Index crashed and burned. How did the shares of Honda, Toyota and Nissan buck the Nikkei trend? These multinationals hitched their business wagons to growth markets away from the moribund Japanese economy. So while the business results of most Japanese companies suffered right along with their economy, the sales and earnings of the auto companies continue to grow. Their stock prices simply reflected their business fundamentals. 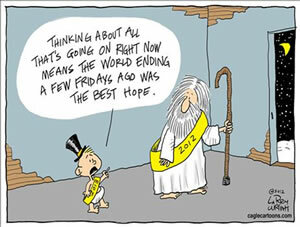 Our optimism about ingenuity does not mean all is right with the economy, of course. Governments around the globe seem intent on hiking taxes and increasing their intrusion into economic life. 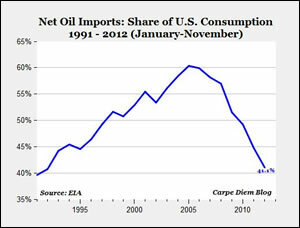 These actions, as we have argued in past Perspectives, act like a wet blanket on growth. And anxiety about the future remains pervasive, further restraining economic activity. But, as we describe in the next section, viewed prospectively, it is important to note that the economy has probably never provided a worry-free backdrop in which to invest. In the shadow of the Financial Panic of 2008, economic forecasts have generally varied between outright doom, to the gloom of the stagnation proponents mentioned earlier. 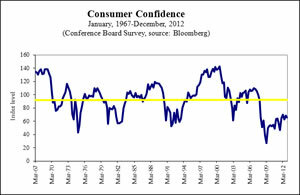 Even four years on, psychology and the general level of confidence remains fragile and haunted by nagging fears that more 2008-like bad news lurks just ahead (click the chart to the right for a larger view). Not surprisingly, stock and bond valuations likewise reflect these glum expectations about the future. The chart below is suggestive of the prevailing valuation situation (click it for a larger view). 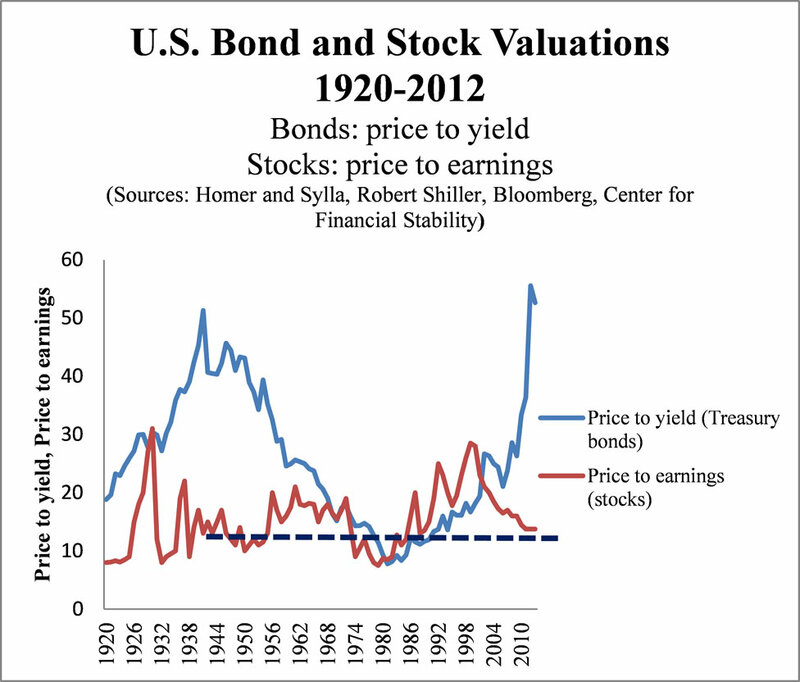 We believe it is salient to note that stocks are presently valued much as they were in the late 1940s and early 1950s. In that early post war period many feared the Great Depression was about to return as government war spending was being unwound and soldiers returned home. Meanwhile, seeking “safety” at any cost, investment money has poured into bonds since 2008. The flow of funds into bonds has helped push yields to record lows and bond valuations to record highs. Aided and abetted by the Federal Reserve’s economic crisis policies—zero interest rates and large scale bond buying—yields today remain lower than they were at the depths of the Great Depression! How reality unfolds compared to the glum expectations reflected in these valuations will be important. For stocks, the expectations “bar” is set very low indeed. As was the case in 2012 when Eurozone troubles and double-dip domestic recession fears once again escalated, the low bar set the stage for favorable surprises, and stocks rose during the year as the fears proved overblown. 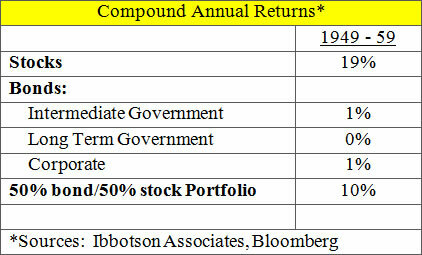 In this regard, the investment environment of the 1950s continues to intrigue. As noted above, the expectations bar was set similarly low as the decade of the 1950s began and was reflected in stock valuations. Despite all this, reality still exceeded the low expectations initially impounded in stock valuations when the decade began. As conditions proved better than expected, confidence rose and a massive stock bull market ensued, as the table to the right reflects (click it for a larger view). We are not saying the contemporary economy is a 1950s clone or that stocks will deliver a 19% annual return for the next decade. We are, however, pointing out that like then, current expectations reflected in stock valuations are very low. Like the 1950s, current economic reality does not have much of a hurdle to clear to deliver favorable surprises. If the current crisis mentality proves unfounded, investor confidence could easily move up a few notches—even with the inevitable troubles that will be experienced along the way. This backdrop provides stocks with a very favorable risk/reward profile in our estimation. The bond market is another story altogether. To sustain current yield levels and current bond valuations, economic crisis and stagnation will have to materialize. We believe such conditions are low probability events. 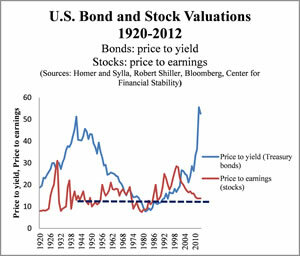 With bond valuations so lofty, even the modest rise in yield levels could prove very challenging to those viewing bonds as “safe” investments. This backdrop saddles much of the bond market with a risk/reward profile that looks very unfavorable. A 1950s-like investment experience for bond investors (see table above) is not out of the question. The trend in Fred? Trust the signal. 1 Theroux, M. (2012. November 25). Help Wanted-Economists that Understand the Economy.Independent Institute blog. 2 Coase, R. (2012. December). Saving Economists from the Economics. Harvard Business Review. 3 Greeley, B. (2011. November 29). Urging Economists to Step Away From the Blackboard. Business Week Online. 4 Silver, N. (2012). The Signal and the Noise; Why So Many Predictions Fail – but Some Don’t. Penguin Press. 5 Postrel, V. (2012. December 16). No Flying Cars – but the Future Is Bright. Bloomberg.